Darrell L. Ross, Ph.D., is a Professor and Department Head of Sociology, Anthropology, and Criminal Justice, and the Director of the Center for Applied Social Sciences (CASS) at Valdosta State University. Ross worked for the Michigan Department of Corrections as an officer, cell block supervisor of mentally impaired prisoners, probation officer, and instructor in the training academy. He also taught in the Police Academy at Ferris State University as a certified instructor teaching subject control techniques, mechanics of arrest, and responding to the mentally ill person. He directed the forensic science program at East Carolina University and served as the Director of the School of Law Enforcement and Justice Administration at Western Illinois University. 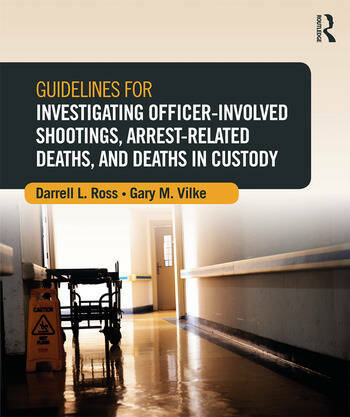 Ross has published over 95 articles, books, book chapters, and monographs on the use of force, stress, and human factors during use-of-force incidents, liability issues, officer-involved shootings, excited delirium syndrome, prone restraint and asphyxiation, sudden arrest-related deaths, and custodial suicides. Ross has provided technical assistance and consultation to local, county, state, federal, and private criminal justice agencies nationally and internationally, as well as to various branches of the military. He regularly provides training to line-level officers and administrators and makes presentations at national and international conferences on officer-involved shootings, use-of-force issues, sudden arrest-related deaths, and custodial deaths. Since 1987, Ross has provided expert witness services regarding these and other topics. Gary M. Vilke, M.D., is a Professor in the Department of Emergency Medicine at the University of California, San Diego (UCSD) and is the former Medical Director for the County of San Diego Emergency Medical Services. Vilke served as the Director for Custody Services at UCSD for over 15 years and is the Director for Clinical Research for the Emergency Department. His research focus has been in the areas of prehospital care and in-custody deaths, and he has published over 215 original articles and 65 book chapters, including more than 50 articles on topics including positional asphyxia, weight force on the back, OC spray, neck holds, restraint chairs, excited delirium syndrome, and the TASER. He has lectured internationally on these topics. Additionally, he has over 35 grant-funded projects, including funding by several national organizations to perform research on in-custody deaths, including the Police Executive Research Forum (PERF), the Institute for the Prevention of In-Custody Deaths (IPICD), and the National Institute of Justice.